We consider the problem of decomposing an image into its material-dependent properties, known as reflectance or albedo, and its light-dependent properties, such as shading, shadows, specular highlights, and inter-reflectance. An example is shown in the next image, which includes `turtle' from the MIT dataset for intrinsic images . At the top of the image you can see the input to our algorithm with the ground truth images from the dataset underneath it. 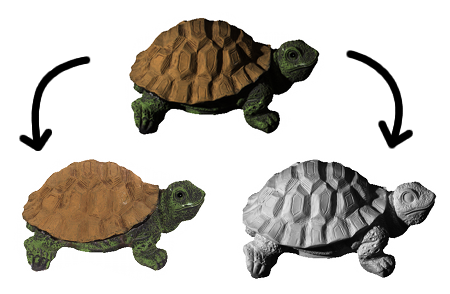 Using the `turtle' image as input to our algorithm, you get the reflectance and shading image shown below (we set the parameter to image optimal; please see the paper for details). All other results are contained in the results archive. Please feel free to download the code from our publication to reproduce the results. The code is written in MATLAB. The files come with `minimize.m'  and `MPIKmeans' . Our code is released under the BSD3 license for research purposes only. Please feel free to contact us per mail: Martin Kiefel.